I needed to go back to Bartley’s in Grapevine to clear up a misunderstanding. In my D Magazine article on the Best BBQ in DFW, I stated that Bartley’s used oak in their smokers, but a few commenters noted that they use hickory. I had to get it from the horse’s mouth, so after a cancelled flight at DFW led to a bowl of red at Tolbert’s, I stopped in at Bartley’s for some meat to go. The knife man assured me that they use hickory, so I either mis-heard, mis-remembered, or mis-wrote the errant information about their wood preference. It’s always good to ask for a mix of lean and fatty brisket and not get an odd stare. Instead the knife man just grabbed a beautiful piece of the point and starting slicing. They were out of ribs, so I added some pork loin to the order based on staff recommendation. Pork loin is a tricky cut to smoke because of it’s propensity to dry out due to low fat content. This stuff was perfect. A thin line of nicely rendered fat hugged the bottom of each moist slice. Smokiness ran throughout the cut, and a nice salty rub really brought out the flavors. This should be a new standard for any regular to Bartley’s. The brisket was good as always. 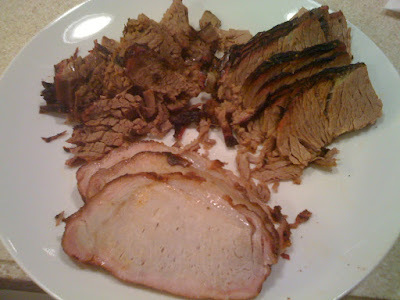 Even the lean brisket was plenty moist, and both versions had a heavy dose of smokiness. It made me wonder why it took so long to get back here. This joint can even make you thankful for a canceled flight. Not much competition here in Grapevine, but they are consistently good.I buy their ribs and brisket by the LB- $11.Keep in mind they are closed Sun + Mon. I was a bit bummed out by my trip to this place. My buddy and I have been trying to hit places you have rated and I had high hopes for this joint. I got the three meat combo and the hot link was good, but the beef was dry as the Sahara and the ribs were dry and tuff as beef jerky.The sides were okay, but the sauce I did not like at all…my buddy and I both thought it tasted like Kraft Original with extra tang/vinegar.My buddy got beef (he did not like it either and he went to culinary school and is far more critical that I am, not that it means much), Chicken (that had a very odd after taste) and the sausage (it was pretty good…I had a bit of all his and he did the same). They also had a guy singing along to a rhythm track on a tape player for entertainment…that was shall we say interesting. I ate there yesterday and the brisket was very disappointing. More like roast beef. Very little smoke flavor and dry. The ribs however were excellent. Next time I’m skipping the beef altogether.